Tome of Alteration is a common Intelligence item card. It is part of the Core Set. In addition to the card's availability in the Core Set, three copies are included in the Warriors of Hammerfell deck. 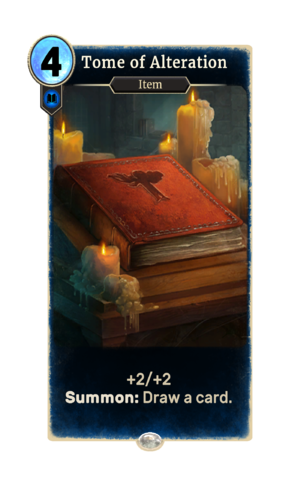 One copy is also obtainable in the Dunmer Avengers deck as a reward from The Brawl. The card is named for the Alteration school of magic.